To reach Anna Hazare’s protest base at Jantar Mantar is not easy. The road that passes by the astronomical observatory built by Maharaja Jai Singh II of Jaipur -- the protest hotspot in the Capital -- is throbbing with humanity and swelling with emotions. And, there is anger against corruption and those responsible for it (read politicians). SUPPORT POURS IN: Mallika Sarabhai bats for Anna Hazare in Ahmedabad. Karnataka Lokayukta Santosh Hegde, who along with the Gandhian activist Anna Hazare has drafted the Jan Lokpal Bill, today said personally he was least bothered about who would head the joint committee to give finishing touches to the proposed legislation. Fali S. Nariman, eminent jurist, has called upon the Centre to end the “farce” on the Lokpal Bill “to an end as soon as possible”. He told this writer over the phone from New Delhi that the most important consideration at this moment is that the Lokpal Bill must be introduced without making a fuss about who should take part in its drafting. Prime Minister Manmohan Singh today appealed to the people of Assam to vote the Congress to power again to ensure state’s development. He urged them not to be misled by the false promises of the opposition Asom Gana Parishad (AGP) and the BJP. Dismissing reports of misunderstanding between the DMK and the Congress, AICC general secretary Rahul Gandhi has asserted that the relationship between the two parties will continue. With the so-called ‘voluntary’ resignation of both the cabinet ministers handling the twin health ministries, Chief Minister Mayawati has attempted to distance herself from the irregularities tumbling out of the state’s health system’s cupboard. The Health Ministry has written to all hospitals to strengthen their hospital infection control policies to prevent bacterial resistance to antibiotics. A major direction in this regard is that no hospital will henceforth administer fourth generation antibiotics to a patient without clearance from the head of the department of the concerned discipline or without a culture and sensitivity report. The Delhi High Court today virtually reprimanded the Central government for hastily honouring IPS officer Amod Kanth and SHO SS Manan with Police Medals for gallantry for their role in maintaining law and order during the 1984 anti-Sikh riots, but refused to strip them of the medal, observing that the officers did “display courage,” the main criterion for the award. After yesterday’s incident when former BJP leader Uma Bharti and former Haryana Chief Minister OP Chautala were booed away by Anna’s supporters, no other politician has attempted to climb the dais on which the crusader is resting. Standing on the other opposite end of the road near small kiosks that sell some of the yummiest food in the Capital, Shiv Sena’s Sanjay Raut is content to watch the milieu from the sidelines. It, therefore, was quite natural that when Gurmeet Singh, the famous Manmohan Singh look-alike, walked into the venue of Anna Hazare's fast-unto-death protest here around noon. For a moment, people even thought that the Prime Minister himself had arrived. 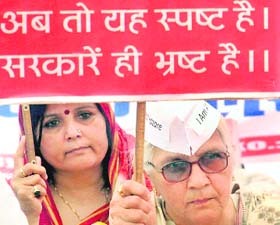 “I am here to support Hazare. The fight is for ensuring a better future for our children. I think that the Prime Minister should listen to him and support him,” he said. If the UPA government wished that the protest would fizzle out like many other movements, it is sadly mistaken. Gathered in front of the dais on which the fasting veteran social activist rests, the number of people is only swelling by the day. From high-voltage impromptu demonstrations lambasting “corrupt” political leaders by a group of college students who did not even know each other before today to organised street plays by theatre groups, the place has now started attracting foreign media. A group of journalists from Switzerland battle their way through to meet Anna. Frederic Lilievre, Economic and Finance chief of bureau with Geneva-based Le Temps, is quite impressed with the happenings around him. “It should work, I think,” he says. Since yesterday, schoolchildren have also joined the protest. Anhiata from the upmarket Vasant Valley School is rubbing shoulders with Pintu from Muzzafarnagar. Anna is proving to be a great unifier. Some like Kuldip Singh Sandhu, an advocate, is here to register with the group. Already six registers have been filled with the names of supporters. By late afternoon, 20 doctors from Apollo hospital had also joined the protest amid slogans “Bharat Mata ki Jai”. But being part of the movement is certainly not easy. Two supporters, Nain Pal and Deepinder Gupta, collapsed because of severe weakness and dehydration and had to be taken to Ram Manohar Lohia Hospital where they are being treated. Hoping that the movement doesn’t die down with IPL matches beginning tomorrow, some like Rajiv Kumar of NGO Freedom Movement are distributing water to mediapersons, requesting that they return back tomorrow. That the movement fizzles out is something the government has been wishing for from Day 1. “What is important is that they (the committee members) should come to an agreement on various clauses of the proposed Bill,” Hegde said while talking to The Tribune here today. Hegde said the committee that drafted the Jan Lokpal Bill consisted of a number of members, including Hazare and advocate Prashant Bhushan. “There were divergent opinions. I also did not agree with all the provisions incorporated in the proposed Bill. But I accepted the draft because in such an exercise one must respect the opinion of others too”, he said. Acknowledging that the Bill would undergo further modifications if the proposed joint drafting committee for giving final touches to the Bill came into being, Hegde said he had no objections to further changes provided the basic spirit of the Bill is retained. “There is no loss of face on the part of the government to agree to half of an even number of members of the drafting committee chosen by Anna Hazare,” he said. He said whatever Bill that is drafted by the Committee of Ten when introduced, will have to pass muster in Parliament because that is a constitutional compulsion. And whatever Bill that is ultimately passed by Parliament becomes law. This is the only way to accommodate the upsurge against the canker of corruption, which has so excited the majority of people of India. Nariman said “this is no time to stand on one’s dignity since the proposal of an even number of members of the drafting committee is not something which is unheard of, much less unconstitutional”. 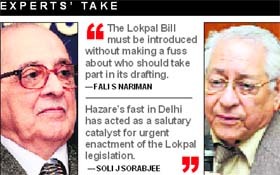 Soli J. Sorabjee, former Solicitor-General of India, says that Anna Hazare’s fast-unto-death has been a “clarion call” and has acted as a “salutary catalyst for urgent enactment of the Lokpal legislation”. He said all ministers, high-level political functionaries of the state and state instrumentalities should be within the ambit of the Lokpal Bill except High Court or Supreme Court Judges because there is a specific constitutional provision (Article 124) for their removal on the ground of misconduct by the process of impeachment. He feels that the Lokpal and the Central Vigilance Commissioner should be kept separate and he is not in favour of a merger of the CBI’s corruption branch with the Lokpal Bill. Sorabjee says that as the Lokpal legislation has to be enacted by Parliament, its provision requires careful consideration. The most important thing is the composition of the Lokpal. It should consist of three members each one of whom has an unquestionable reputation for integrity and independence. The findings of the Lokpal one way or the other on a charge of corruption will have great moral force and binding effect in view of its composition. Dr Subhash C. Kashyap, constitutional expert and a former Secretary-General of Lok Sabha, is not in favour of legislation on matters of state policy being decided by hunger strikes. “We have to decide whether we believe in representative democracy or not and if so, it is the people’s representatives who have to decide on matters of legislation and state policy”. Dr Kashyap says that the present Lokpal Bill is most unsatisfactory and should be revised fundamentally. 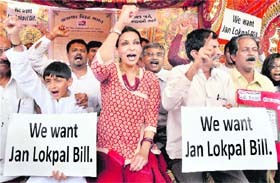 Some good points in the Jan Lokpal Bill can be incorporated into the Bill. However, it has some objectionable points which strike at the root of the Constitution and democracy. For example, giving the Lokpal executive and judicial powers even over the Supreme Court will violate the constitutional scheme. Justice Rajindar Sachar, former Chief Justice of the Delhi High Court, says that the government should realise that the Lokpal Bill cannot be an all-encompassing one. It is basically meant for ministers, legislators and bureaucrats. The idea of including judges in the Bill is preposterous. There should be a separate institutional mechanism like the Judicial Standards and Accountability Act to deal with judges under a cloud. Justice A.R. Lakshmanan, former Supreme Court Judge and Chairman, Law Commission of India, says that a comprehensive and effective Lokpal is “absolutely necessary” to check corruption in the country. However, the draft Bill, in its present form, requires many changes to make it more effective. He says it is wrong to say that the Centre is not doing anything to root out corruption. The PM is “very serious” about the introduction of the Lokpal Bill in the monsoon session of Parliament, he says. Lucknow: The state unit of the BJP on Thursday alleged that the Mayawati government was involved in scams to the tune of Rs 2.54 lakh crore and said the party would soon submit a report on it along with documentary evidence to the authorities concerned. The party has also prepared a ‘First Information Report’. “Mayawati is using the government system as an ATM, which is being funded by the poor. No transanction happens without paying Maya Tax,” claims the FIR. “I would like to appeal to the people of Assam to give the Congress another chance so that the development work undertaken by the government over the past 10 years could be completed; and at same time, not be misled by the propaganda of the AGP and the BJP,” he said while addressing an election rally at Barpeta in western Assam, about 120 km from Guwahati. Manmohan Singh was in Assam to address two election rallies - one in Barpeta and the other at Sipajhar in the northern Darrang district. He returned to New Delhi later. “When the Congress government took over in 2001, the state’s economic status was in a shambles and we had to really work hard to bring back Assam to a stage where we can proudly claim it is on the right track now,” he said. “Development work in Assam was literally not moving at all during the AGP regime and the law and order situation was very bad,” he claimed. Manmohan Singh also mentioned the peace talks with the outlawed United Liberation Front of Asom (ULFA), and said the Centre was committed to finding a solution to the long-standing insurgency problem in Assam. Addressing an election rally at Karaikudi, he said Tamil Nadu was one of the most progressive states in the country and sought people’s support to continue the trend for the next five years. About the role of the Congress in state’s development, he said it had allocated Rs 1 lakh crore to the state over the past five years for development projects. This was the largest amount given to a state, he claimed. “We are going to continue the partnership for the development of Tamil Nadu and India,” he said. To beat the strict EC vigil and reduce the impact of rising petrol prices, Chandan Brahma, Bodoland People's Front (BPF) candidate from the Sidli Assembly constituency in Assam, has rediscovered the forgotten horse carts as an effective tool for low-cost electioneering in rural areas of his constituency. "Horses can travel fast on rural roads and that too without petrol. Moreover, there is no worry about EC officials catching up with them," a campaign manager of Brahma said. 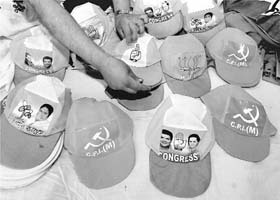 Caps bearing symbols of various political parties on display at a shop in Kolkata on Thursday. NCP candidate from the Gauripur Assembly constituency in Dhubi district of western Assam on Thursday organised an all-women cultural rally in the small town to attract voters. The women in the rally draped in the best of their ethnic dresses brought the traffic on the road to a grinding halt while dancing and singing along their way. Former Team India skipper Mohd Azharuddin on Thursday played on an absolutely different wicket in the poll-bound Assam. The former cricketer was in the minority-dominated Jania constituency in the state to bat for Congress candidate and sitting MLA Abdul Khalek, who is on a sticky wicket this time thanks to tough challenge from the rival All-Indian United Democratic Front (AIUDF) candidate. Preliminary investigations clearly indicate financial anomalies being responsible for the sensational murders of two consecutive Chief Medical Officers of Family Welfare: Dr B P Singh on April 2 and Dr Vinod Arya in October last year. Announcing a series of decisions in a hurriedly called press briefing this evening, the state cabinet secretary Shashank Shekhar Singh confirmed the resignation of Mayawati’s close aide and senior BSP minister Babu Singh Kushwaha as minister of family welfare and Anant Kumar Mishra from the ministry of health. “The CM has forwarded the resignation letters to the Raj Bhawan for approval,” said Singh while refusing to clarify if Kushwaha would continue with his additional portfolios as minister of metallurgy & mining as well as cooperatives. Also, the government is evolving a system to put powerful antibiotics under the restricted sale mechanism and analyse all past data on antibiotic resistance. There have been 400 publications on the subject in the past three years. These will be analysed for policy intervention. “The matter of bacterial resistance to antibiotics is not news to us. This is a common phenomenon, which every country encounters because nature has given bacteria the power to survive. This power enables them to develop resistance to drugs. And such drug resistance bacteria can be found anywhere. In India, we are working hard to prevent their adverse effects by putting in place proper infection control strategies,” Director General Health Services RK Shrivastav today told TNS.